I’m super excited to be participating in my first ever blog hop! 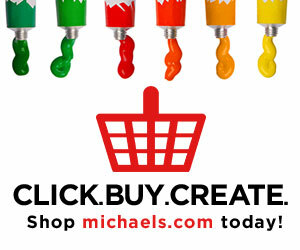 I’ve teamed up with some of my favorite designers to bring you all some amazing Valentine’s Day themed crochet goodies! Scroll down to see the full schedule. If you’ve been keeping an eye on my Instagram feed, then I’m sure you’ve seen this little beauty I’m sharing with you today. 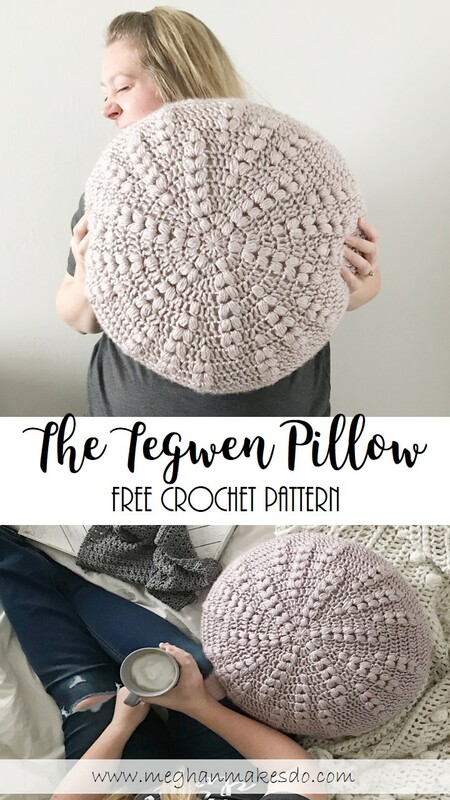 The Tegwen pillow is made using two puff stitches together which creates little “hearts.” It’s perfect for those of you wanting to do a little holiday crochet, but also subtle enough to be used all year round. I used Red Heart Soft Essentials in Biscuit which is a bulky weight yarn with a bit of shine to it. I’ve had this yarn in my stash since last year and have been waiting to find the perfect design to make with it. I’m so happy with how this pattern turned out and can’t wait to start seeing all your Tegwen Pillows! Finished pillow measures 20” across. Rows 1-3 of front panel = 4.5” diameter circle. Pillow is worked in two pieces sewn together. Ch 2 at beginning of rounds does not count as a stitch. Work first st of each round into same st as joining. Stitch counts at the end of rounds tell how many dc and puff stitches were worked in each round. Only work into puff stitches when indicated in pattern. When the pattern says to work in the space between stitches, work in between the current stitch and the next stitch. Fasten off leaving a very long tail for sewing. Weave in all other ends. Lay both panels on top of each other with wrong sides together. Then, using a large tapestry needle, whip stitch the edges together going through both loops on each panel, about 2/3 of the way around. Since each panel ends with a different amount of stitches you will need to go between the stitches on the back panel every few passes. It may help to use stitch markers or pins to attach the pieces together before sewing. Insert pillow form and whip stitch closed. Fasten off and weave in ends. I hope you enjoyed making your Tegwen Pillow! 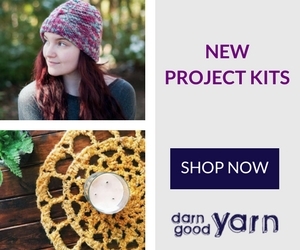 Remember you can also find an ad-free PDF in my shop, on Etsy or Ravelry. I’d love to see your finished Tegwens so don’t forget to share using #thetegwenpillow on social media! Now hop on over to these other amazing blogs to find more valentine’s day themed patterns! I’ll be updating the links as we go so stay tuned!